Box wrapped in red paper with white dots sitting next to wrapping paper and gift tags saying “Love” and “Be mine.” Image by Miroslava, via Unsplash.com. Do you know a gadget guy (or girl)? Here are the perfect gifts for them in 2019. The holidays may be over, but if there’s an important guy in your life, there’s never a bad time for a gift. Let’s not forget that Valentine’s Day is coming up as well. No matter what your guy may be into, there’s sure to a be a gift on this list for him. From a turntable for the guy who’s getting into – or has always been into – vinyl, to a streaming stick for the guy who wants to cut the cable cord, read on below for some gift ideas for the gadgets guy in your life. Whether your guy is just now getting into vinyl with its resurgence in popularity or he’s long been a fan of records, the Audio Technica AT-LP60 is the perfect gift for any lover of vinyl. Sure, you can scour estate and yard sales for some old-school tech, but why not make things more fun? Being able to stream your vinyl to some Bluetooth speakers might just be a hit at his next party. While most virtual reality headsets are still pretty expensive, Samsung has introduced an affordable option for the gamer guy in your life. He may only be able to use it with a Samsung Galaxy phone, but that can still mean hours of VR fun. The unit comes with a controller that allows you to drag, drop, and select with a flick of your wrist. Sutra Mini vape pen; image courtesy of author and Gotvape.com. Vaporizing cannabis is one of the most popular consumption methods because it lets you get the most out of those wonderful cannabinoids. For the guy in your life who is fond of vape pens and who is either a recreational or a medical consumer, consider the versatile Sutra Mini, designed for both dry herb and concentrates. 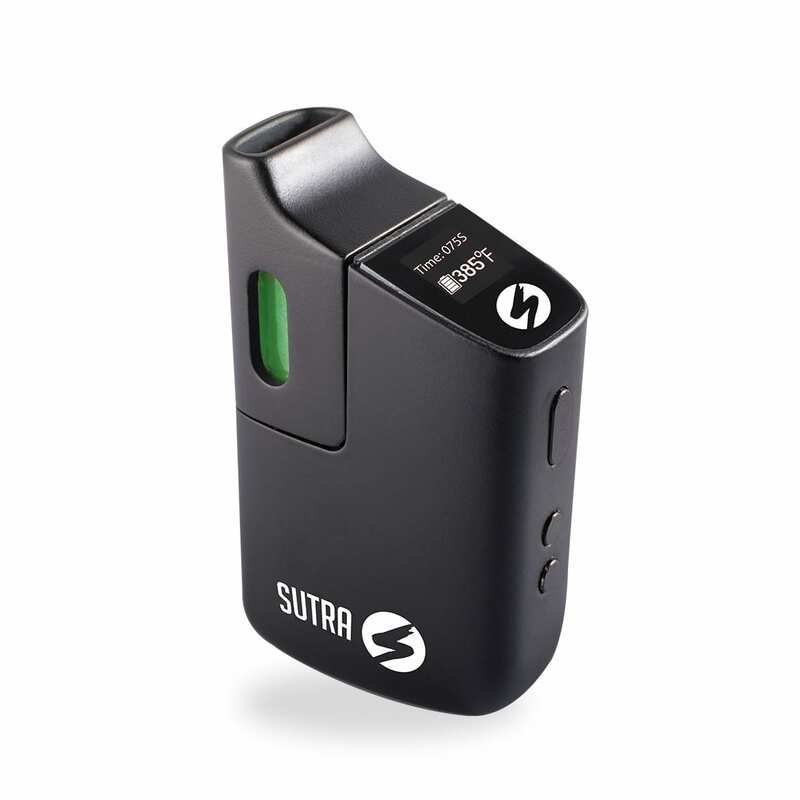 The Sutra Mini will give him complete temperature control, and it’s small 3-inch by 1-inch profile is discreet and fits easily in his pocket or palm. If your guy is talking about cutting cable to save money, you might want to present him with this alternative. The Roku Streaming stick comes with widely used apps like Netflix and Hulu, but there are also a wide array of other apps and channels available, too. The most recent version goes 4K with its streaming capacity, sure to excite him and transform how he watches the telly. For the active guy in your life who wants to track fitness, but doesn’t want to wear something obvious: The Misfit Ray. It has a sleek, minimalist design, but still provides all the functionality he wants. It monitors sleep and activity along with delivering notifications for texts, calls, and alarms – all while looking like a hip accessory. This is the voice command gadget that began it all. The Amazon Echo can do it all from turning down the lights, firing up the thermostat, playing your tunes, or tuning in to that can’t miss television show. Need delivery ordered? Amazon Echo can do all that, too. Its 360-degree speakers produce excellent sound and it can hear your voice from across the room. If your gamer guy has all the up-to-date systems like PlayStation 4 and the Xbox One but constantly yammers about the “good old days,” then the NES Classic Edition is the perfect gift for him. Keep him busy for hours (or days) and feeling nostalgic with the 30 of his favorite games, including Super Mario Brothers, Legend of Zelda, Donkey Kong, and many more. Any of these gifts is sure to a be a hit with any guy in your life. Now, your only problem is going to be deciding which one to get for him – and which one to keep for yourself, because let’s be honest, girls love gadgets, too!